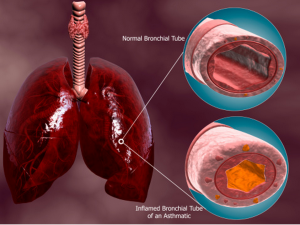 COPD/Bronchitis - Colorado Allergy & Asthma Centers, P.C. COPD is a group of lung diseases that make it harder for a person to breathe due to blocked airflow in the lungs. Because COPD and asthma share many of the same symptoms, it is necessary to visit an allergist/immunologist to differentiate between the two so that you can get proper treatment. All of our physicians are Board Certified in Allergy and Immunology. Additional training in either Internal Medicine or Pediatrics is necessary to be certified and, as a result, they are able to understand and treat lung diseases like Chronic Obstructive Pulmonary Disorder (COPD) and bronchitis. Through diagnostic testing, physical examinations, and a discussion of the patient’s medical history, our physicians are able to craft a unique treatment plan that allows patients to control symptoms and reduce the progression of damage to the lungs. For addional inforation, you can visit the American Academy of Allergy, Asthma & Immunology’s COPD page by clicking here.